The inference is that when life gets tough, it’s time to escape, to run away, to avoid the pain. It’s the way so many people live, but is it the most resourceful? I remember as a teenager, I used to work at an aged care facility on weekends, helping to serve meals and clean the dishes. I had to use one of those large commercial dishwashers and when I first started working there, I could hardly touch the dishes when they first came out. because they were so hot. Then, over time, my fingers became tougher and more resilient. Even now 25 years later, I can still pick up hot dishes without flinching, much to my own kids’ amazement. It’s easy to escape when life gets difficult. But that’s not going to help you to achieve greatness. Great careers, great marriages, great achievements in any field aren’t developed by people who run away. They are built by people who are able to stay the course, to become stronger, to build their capability. 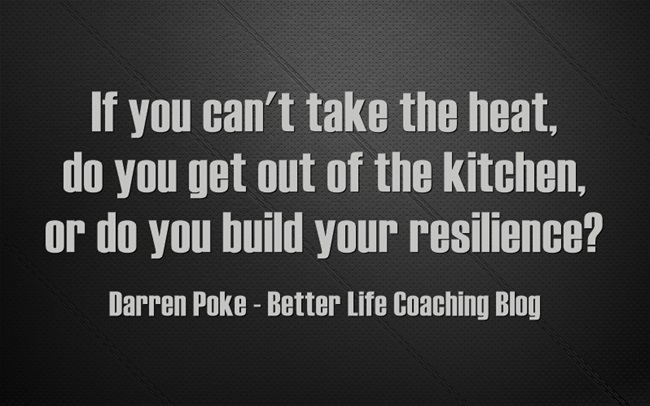 So if you can’t take the heat, build your resilience!